I almost never plan to create a new character. Usually it's an impulse, with alarmingly often a cosmetic outfit as reason. This time, the reason was the new PvP bracket: a friend wanted to come along with our lowbie Imp PvP, but his Imp character wasn't high level enough (level 30+). The plan was to play some lowbie-lowbie PvP (level 10-29) with him to speed up his leveling. But I didn't have any low level Imp character to PvP with. 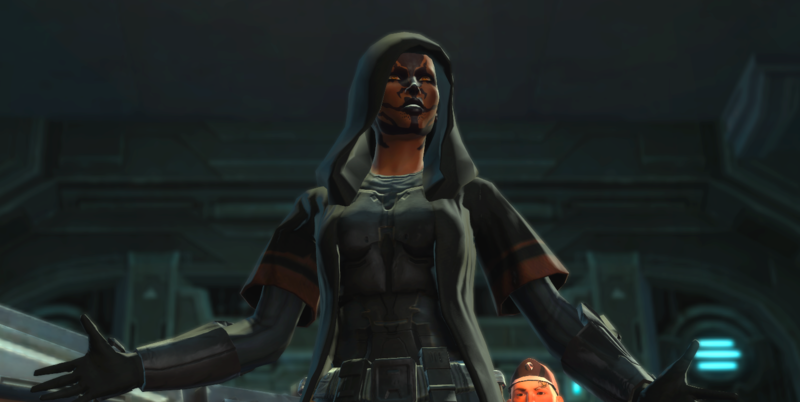 And thus my third Imp character, sith warrior Waseme, was born. I've been told by the internet that 'Waseme' means 'let them talk', so she was bound to be a bit snarky. I soon decided to make this character (nr. 11) my first pure dark side character. As as some of you might know, this was bound to create a breeding ground to internal conflict. Whoever thought it was a good idea to provide Waseme with a lightsaber was wrong, very wrong. Unsurprisingly, the sith warrior story seemed to revolve around 'kill person A for no reason, kill person B for no reason, kill person C for no particular reason'... I think you get the idea. It cost me a certain amount of psychological effort to pick the option to kill my own master, but you get used to it. At least you don't know the people you're ordered to kill personally (most of the time), which makes it easier in a twisted way. Besides, being totally creepy also has its advantages. When Waseme was suddenly confronted with a double team of hired guns pointing at her, her appearance certainly worked in her favour, resulting in my favourite warrior-quote so far. "I'm going to kill you and eat you all raw!" Not kidding. Hey, at least it worked. Never seen a group of grown-up and well-armed men run away that quickly. It turned out to be harder to play dark side when characters around you got involved. I'm talking about Waseme's companion Vette, which I instantly loved. Vette wears a shock collar that she would like Waseme to take off. With typical Vette-humour: "Not that I don't enjoy the perpetual fear of electrocution." I had to say no. Sith warriors are supposed to be evil, right? I mean, murdering half the galaxy and then removing your slave's shock collar just because she looks so sweet doesn't really make sense. So I was stern and said 'no'. We traveled to the next planet, exterminated some random people, business as usual. But guess what when we returned to the ship? "Okay, hey. Sith master person of questionable temper and such?" "I've been extra good with the behaving. Did you notice?" Vette waits a moment, the camera zooming in on her hopeful face. "So how about taking this shock collar off me?" The cute little face. The despair in her big eyes. Her hopeful voice. Gaaaah. I could not do it. I could not shock her. I could not be evil! The thought of coming back to my ship each time and Vette keeping to ask me over and over again to remove her shock collar became unbearable. I kept pressing escape to try and look for a way to talk myself out of it, but there was none. I spent two full days of just standing on my ship, staring at cute little Vette in despair (with the occasional warzone pop in between). I didn't continue with any quests on my warrior because I couldn't reach a decision. I didn't want to betray my character by not being evil, but I also couldn't shock Vette. Eventually I removed the collar, then quickly logged off. Yes, I am WEAK. I tried to make it all make sense by releasing Vette because she was "strong" (as in strong-willed, I guess, she doesn't make for much muscle power), but it really doesn't. I told myself that Waseme was a bit like a Klingon, believing in warrior culture. This does mean a lot of violence, killing and praising the strong, but it doesn't necessarily mean beating ('shocking') the weak when there is no honour to gain. I guess this is how I'll have to play my warrior. A weakened version of a pure dark side character, but at least one I'm able to face playing. /comfort One day you will be able to play a real evil character. I have faith that you have an evil side in you! Another option would be that her taking away the shock collar would be a way of her to show that she doesn't need any "toy" to keep a slave in line. That if the slave misbehaves Waseme can just put the slave back in her place with her own sith powers. Hahaha. Your second proposal was actually an additional idea I had in mind, but I forgot about it when writing the article. It does show your power when people listen to you even if they are 'free'. Hahahahah. 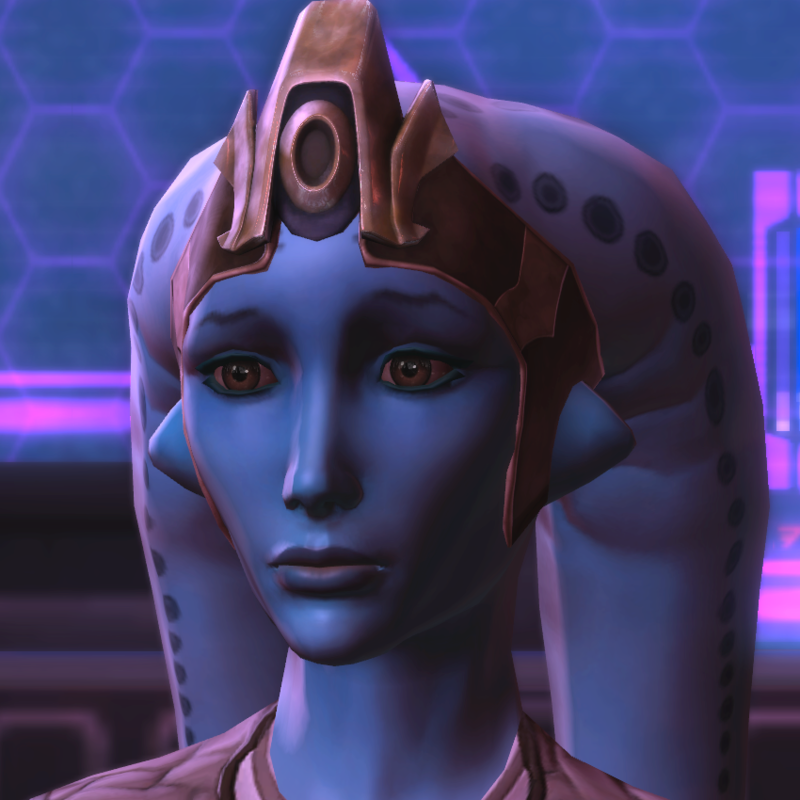 I loved Vette so much, but as I similarly tried to play my Sith Warrior as pure evil (Chris gave me no end of grief for this) she definitely did not love me nearly so. I took off her collar the first time she asked but only because it gave me no light-side points. I think I ended up sending her away on crafting missions just so she wouldn't be around whenever I said evil things, heheh. Vette is so amazing! And yes, I do remember. Was fun, though. Hehe, on my own mostly dark side Sith warrior, I went through every single conversation about Vette's shock collar that's in the game. (I think there are five or so, quite a lot really!) I rarely shocked her, but I basically laughed in her face every time she asked me to take it off. "You're a slave, it's only appropriate. Stop being weird." Eventually I reached a point though where the story wouldn't advance any further, and I kept getting repeats of the same conversation. After the third time or so I caved in and set her free. I figured that my warrior was getting tired of it too, but also felt a certain mix of amusement and admiration for Vette's sheer stubbornness. You kept the collar that long? I'm impressed! I sneakily took a look at how long Vette would bug me about the thing, and when I found out it wasn't going to change I really lost all my perseverance. Although (slight spoiler:) I also read that you would get a companion that asks if she may shock Vette and if you let her she eventually jumps out of an airlock. This all went a bit too far for me. I think I left it on initially but took it off the second time she asked. The truth is even the most evil characters show kindness once in a while, to their pets.